All camp prices include a souvenir Garden item. We provide one afternoon snack for full day camps. Every camp has exciting hands-on activities including experiments, games, and crafts. 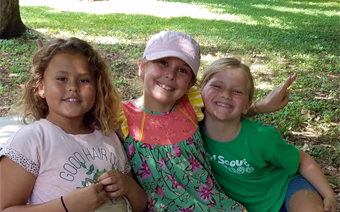 Campers explore many different areas of the Garden through nature walks, free time in the Children’s Garden and organized physical education games in the afternoons. All cancellations must be received 14 days in advance to receive a full refund. Cancellations up to 13 days in advance will receive full credit for a future program. Join us for daily adventures into the history and symbols of our great state as the Garden celebrates the Bicentennial. Each day will be its own theme that will get campers into the Garden to explore, learn and enjoy. Sign up for one day or for the whole week. To sign up for early care please contact Misty Hertzig at 256-830-4447 ext. 253 or mhertzig@hsvbg.org. 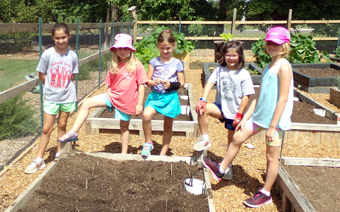 Junior Master Gardener introduces and reinforces gardening skills for all ages. 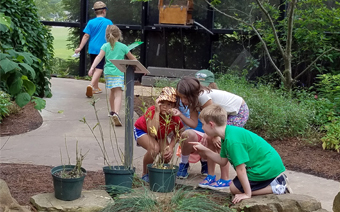 Campers will have the opportunity to explore and learn about the environment around them. They will also get a chance to get their hands dirty and work out in the Garden too! This year’s camp is for Brownies and Juniors and will focus on the Citizen Scientist requirements. We will explore the natural world and learn how we can help others to understand it better. The “Think Like a Citizen Scientist” badge will be included with the cost of the camp along with a custom HBG Day Camp badge! We will explore the world with Jack and Annie in this magical adventure. We will travel through the past, present, and future of our state (and many other places around the world) as we celebrate the Bicentennial with the Sweet Homegrown Alabama exhibit. Shel Silverstein has a silly collection of made up animals and places in his poems and shows a love of nature with his book The Giving Tree. We will enjoy his writing, the natural world, and even doing a little silly writing of our own. Join us for daily adventures into the history and symbols of our great state as the Garden celebrates the Bicentennial. Each day will be its own theme that will get campers into the Garden to explore, learn and enjoy. Sign up for one day or for the whole week. This week will be a different experience than the one in June. We would love for your camper to join us for both!